Today is our third and final day in the High Atlas Mountains. We slept up until breakfast was ready and Omar’s knock on our door awakened us for the meal Mohammed prepared which included boiled egg, bread and spreads. Of course, the spreads included jam and honey, and the mint tea was available with sugar. I think Morocco would be a dentist’s dream…it’s all about sugar here. Salt on the other hand is hard to come by. We have yet to have any offered for our eggs at breakfast. We began a bit earlier today and turned left out of Ait Aissa onto the non-descript trail to begin our climb to the Tizi Oudite summit. We passed through the village and followed the trail toward the summit past animal shelters and terraces of barley and fruit trees. A scare crow stood on a fence near the crops and flat rocks which were used to offer salt to the gods were placed by the orchards. No wonder salt is never offered at meals. It is used for more important things! Birds chirped in the warmth of this sunny day as we maneuvered the trail with Omar, Mohammed and his mule. Omar has a band and while he is not the lead singer, he cooed his songs about love in the Berber language as he strolled along with us. This area of the mountains seemed much warmer than the parts we hiked the previous two days, and we spotted a few blooming flowers. Somehow, I picked up the nickname, “Elizabeth the queen”, from Omar…perhaps because I could sort of keep up with them when they hiked up the trail at their pace. As such, I followed Mohammed and his mule up to the summit while Omar hung back with Suman. The weather and the view from Tizi Oudite’s summit at 2,219 m was spectacular! Mohammed and I sat by the cairn as we soaked in the sun until Suman and Omar arrived. I highly recommend Omar as a guide. His company is www.astaratours.com. From the Tizi Oudite summit, we continued down the other side of the mountain for Matate Village. The trail was muddy at times and it was hard to believe we were hiking in a snowless area when on the other side of the valley facing away from us was a ski resort! On our way to Matate Village, we passed by another herd of goats. This time I spotted the shepherd who leads his goats to the summit of the mountain to graze every day! They liked grazing in the trees on the way. In Matate, Omar invited us into his sister’s house. Uniquely, she wasn’t there as she recently gave birth and was staying at Omar’s house, but her kids were there and her teenage daughter had prepared a tajine and tea for us. How nice was that? While her daughter and the younger cousins didn’t join us for our pre-lunch snack, her son, Rashid, and Omar did. We ate the typical Berber way and used bread as our utensils. Rashid was the only boy in family of six kids. He was finishing up school near Omar’s house, so he joined us for the rest of our walk in order to get a ride into the market to pick up some meat for the family and then to get a ride to Omar’s house with whom he was staying as well. It turns out, Omar had a full house including his wife, child, mom, sister and baby, and nephew! Our walk took us by more villages, schools, and orchards. I can only imagine how the terraces looked when the apple and cherry trees were in full bloom. How pretty they would be in a few months! We passed by a few more cemeteries as well which to outsiders looked like a patch of grass. We talked about being buried versus cremated. I said I wanted to be cremated and Omar said it would be better to be buried because it wouldn’t use wood. I told him, well American’s use wood for the coffins. Omar informed me that in Morocco, the dead are dressed in a white dress and buried without a coffin. It was an interesting conversation. Eventually the trail turned into a road and a few cars zipped by which gave us a feeling of reaching civilization again. We stopped at a shelter in Agersioual Village where Mohammed prepared us our final meal. At this point we were hardly hungry, but we politely tried the salad and tajine as we enjoyed the view of Morocco’s highest peak, Toubkal which stood blanketed in snow at 4,142 m or 13,671 ft.
After lunch, we were transferred back to Marrakesh to begin our Dreamtrip. Our vacation club requires that all accommodations for Dreamtrips be a four or five-star hotel. After two nights of primitive quarters, we were excited to get to Le Méridien N’Fis. Our car was checked for explosives before the gate was opened for us to drive to the entrance. We entered the fancy lobby, checked in at the front desk, and then met our Dreamtrip host, Fernando who was from Madrid. The bellman led us through the large garden past the fitness center, pool and spa on the way to our room. We were so excited for a hot shower and air-condition as the daytime temperatures were unseasonably warm reaching the low 80’s. We turned on our wall unit and waited for the room to cool as we cleaned up for the welcome reception which included free drinks (non-alcoholic since we were in a muslim country), appetizers, and dinner. 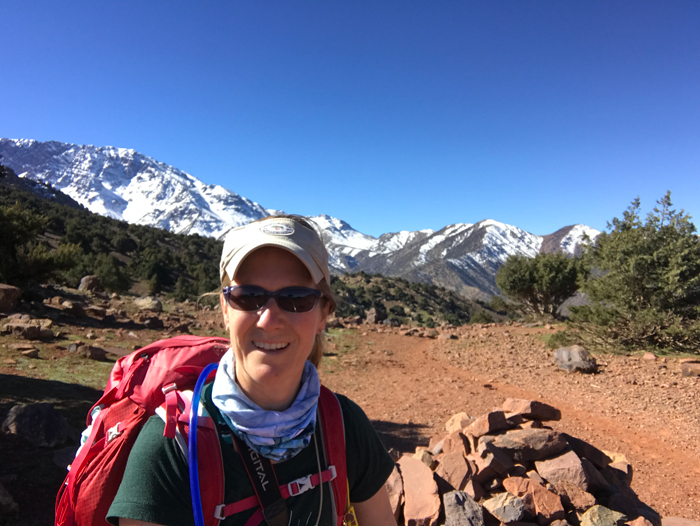 Previous Post Summiting Tizi Mzik in the High Atlas Mountains!